Mystery and uncertainty are just around the corner with this minor key solo by Ryan Chesser. This piece is great for teaching artistic expression and balance between hands. 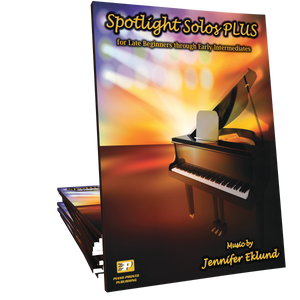 Your moody teenage students will love this expressive showcase solo! My teens love this piece! It has such a beautiful haunting melody. This a must have for all teachers that have teen students! Last year several of my teens played this piece. It has a beautifully flowing melody that captivates you from the very first phrase. As a teacher, I love this piece because it’s a great study in hand balance and rubato, and since it’s in G minor it’s just tricky enough to keep students on their toes, but easy enough to make it accessible. I gave this piece to one of my teen boys this week. He loves the rich sounds and the G minor key. It's been in my library waiting for the right moment to assign it to a student. Beautiful lyrical piece. Excellent, musical, mysterious, mesmerizing! It's a must have for your teens! Beautiful, lyrical, mesmerizing piece that truly took the audience's breath away at my last recital. This piece has captured the attention of both my teen boys and girls--in a BIG way! One of my teen girls says it sounds like it should be the soundtrack for a teen vampire movie like "Twilight." Rich, lovely sound! I love this piece. Looking forward to more pieces from Ryan! This piece is enchanting; it evolves well and has sounds that "take you away." It just draws one in as it unfolds. Yes, a 5-star, to be sure. Simply enchanting! Lovely melody with a slightly darker mood. Several of my students will LOVE this piece! Your teens won't be able to stop playing this piece! And YOU might find yourself having the same "problem!" On a personal note, my 15-year-old son stopped taking piano lessons last year. It was hard for me to let him do that, but I knew if he stopped while he had good memories, he might return. Fast forward to hearing me play this song. He walked in the room and said "I want to learn to play that." What a beautiful song! I hope to see many more like this! My picky teen student loves it! Beautiful melody and harmony. A sure recital crowd pleaser!